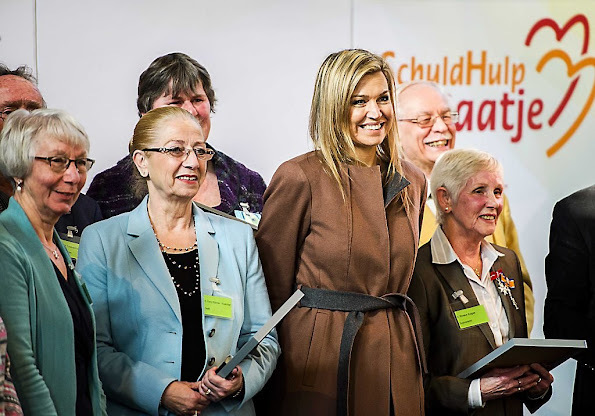 Queen Maxima of The Netherlands visit debt relief Buddy Netherlands (SchuldHulpMaatje Nederland), a national organization that helps people who have got into financial trouble or at risk of exclusion in Leiden, The Netherlands on February 17, 2016. It is always interesting to see Queen Maxima. I'm not sure, if a winter coat matches with open summery shoes, especially if you don't take it off during engagement. I agree. A little early for those shoes but - geez! - I love them! Was ist mit Maximas Schwester (Inés Zorreguieta)? Siehe Twitter Koninklijk Huis! Vielen Dank, Anonymous 11:42 PM, für die Rückantwort bzw. Erklärung. May I know which language is this? German (Deutsch)!... and Dutch (Nederlands). ich Dutch oder Nederlands meine? 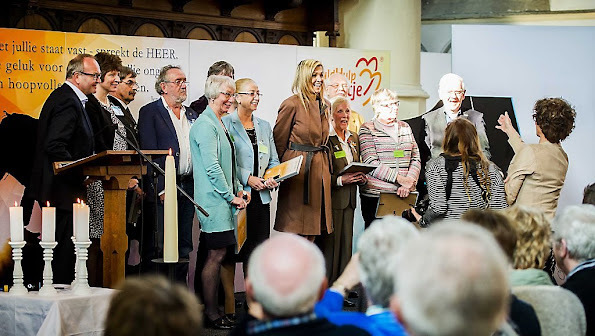 Ik begrijp niet goed wat je bedoeld Emma..
always having fun with style, look at that bejeweled cuff on her right wrist, and then in a later picture it is silver on the other side. Sweet! I wonder what those stones are. I love her recent wrap coats. When others wear a wrap coat it is called a bathrobe but of course maximum Maxi could never be told it is a bathrobe. Maxima certainly has a love of modern, dramatic statement jewellery. Over at http://princessmonarchy.eklablog.com/ we can see that in other pics of this visit, the silver cuff has been repositioned, so that the stones on the outside of her wrist, not the inside. My guess is that the cuff is unbalanced. The weight of the stones causes the cuff to rotate, so that the top gravitates to the underside of the wrist. This is not an uncommon problem with jewelled cuffs. I love cuff bangles -- but I would never buy one like this, because I would find the constant need to reposition the cuff "right-side up" very annoying. If the cuff is allowed to remain in the "upside down" position, both the stones and the wearer's clothing risk being damaged. It will be interesting to see if Maxima perseveres with this cuff and wears it on other outings.